Please clarify if the dealer 'A' is registered in Vasai . He had purchased material from some other party located out of Vasai and supplied that material to another party who is located out side Vasai. In this case, is he liable to pay local body tax on this material which did not enter into Vasai limits. Please confirm what is the percentage of the tax. How to calculate LBT while costing for Purchasing goods. 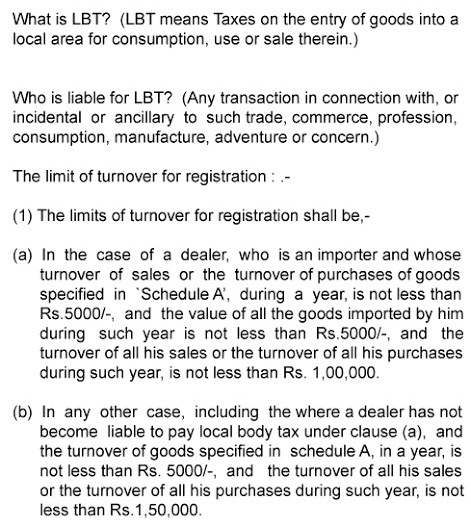 b) My second query is if a dealer is outside LBT zone selling goods to another dealer who is again outside LBT zone, are goods allowed to enter the LBT zone and pass through. ?? @Ashish... L.B.T. will be applicable on Gross Purchase Value... If your Bill Amount or amount payable to Party is Rs. 1500/- and the rate of L.B.T. is 1.3%, then your LBT liability for that purchase/bill is Rs.20/-. LBT is payable on a monthly basis by the 10th of the next month. Vendor/supplier will not charge the LBT extra in their bill. If the vendor or supplier is a trader and he is in LBT Zone then he will add the LBT cost in their sale rate. B] Yes.. It is allowed... but they will check your documents at LBT Naka. @Zahid... LBT would be introduced into Mumbai’s civic body from October 1, 2013 … so don’t worry about LBT. But you have to pay the Octroi. @Kishor Jain ... If your shop is in Thane area and you are purchasing Gold from outside Thane then 0.2% LBT will be applicable on Gross Purchase Value. LBT is applicable on Purchase not Sale.. If you are selling Items outside Thane region and that area falls under LBT then the customer will pay the LBT on his purchase. By applying LBT Electronics & Electrical price go up or down????? @Tausif... If you are importing and exporting then there will be no LBT. You have to only produce proof of export. But if you only importing material from outside India and that the material used, consumed or sale in India then you have to pay the Local Body Tax on all the imports. First of all..you are doing great job clearing doubts of everyone! 1. I am a wholesale trader in Pune.I understand If I buy goods from outside Pune, I need to pay LBT to govt on my purchase value.Please correct if am wrong. 2. Now if I see the same goods to Pune retailers then will the LBT be applicable again on those goods? If yes who should pay it? 3. If I sell the same goods outside Pune (where LBT is not applicable) then will I get any LBT refund? If yes what is its percentage? 1. YES, You need to pay LBT to Government. 2. If you are purchasing and/or selling the goods within Pune limits then there will be no Local Body Tax. But If you are purchasing from outside Pune and Selling in Pune .. in that case you can recover the L.B.T. amount which you paid to the Government from your customer by simply adding/amortizing in your sale rate. is their having any kind of process or exemption option like N forms and all like octroi. Hi Sandeep... If you are exporting the material which you have imported earlier then there will be no LBT. But if you are sourcing material from India and your consignment is passed via LBT Zone for the purpose of export in such scenario LBT will be applicable. SR: Please clarify I have registered business in Vasai and i am buying good from Mumbai and bill to Mumbai base client in this case i am liable to pay LBT on material which did not enter into Vasai limits. If yes then who will pay LBT client or Me? How LBT is applicable to a Flour Mill, where only grinding services are provided? (a) Who is liable to Pay LBT? (b) On which value surcharge is levied? (c) Same can be collected from customer? @Ganesh Gunjal... Purchaser/Importer liable to pay the LBT.. There is no surcharge but the percentage of LBT depends on what product you are purchasing or importing... you can recover the LBT amount from your customer. A Company registered in mumbai imports goods. Stocks the goods outside muncipal limits, thus not paying octrio. Sells all goods outside limits of Mumbai. Presently not incurring Octrio since goods are not consumed in Mumbai. If same struture then as per your answers before LBT payable then. IF registration changed to outside mumbai ( outside municipality limits is LBT payable then. As far as my understanding goes. Octrio is payable if the goods enter the muncipality limits of mumbai. And the logic of octrio is if it is consumed in mumbai octrio should be paid. If I register my cimpany and carry out business outside mumbai limits where no lbt is applicabke say bhiwandi is the law satisfied and no lbt applicable. There are lot of companies registered in mumbai having sales all over india. Such companies used to have warehousing outside BMC limits ( their purchase being Imports from foreign countries OR factories outside Mumbai limits ) and they carry out their distribution all over india from their warehouse. If they have any sales in mumbai they used to pay octrio only for the goods getting inside and sold in mumbai. Now pls suggest how such companies can carry out the above activity within the framework of the law. If the company cannot operate without the incidence of Octrio, it will render it out of business since companies registered outside mumbai will have substantial cost savings of Octrio cost. Dear Shridhar, Many thanks for your guidance & clarifications on LBT, which have been most useful. I have a unit in Navi Mumbai, where I was registered for cess (applicable & inplace of Octroi in Navi Mumbai & pay 1% cess on all purchases in Navi Mumbai. a. When I sell in Navi Mumbai, I make the cess a part of my cost. b. When I sell outside navi Mumbai within 6 months of purchase, I get a set off / refund of 90% of the cess paid. Under LBT will I get any set off or refund on the amt paid on purchases brought into Navi Mumbai & then sold outside Navi Mumbai as applicable under cess ? @Sanjay Gupta... All municipal corporations in the state of Maharashtra will start implementing LBT within due course.. So there is no escape… and as far as LBT is concerned it is lower than the Octroi. Therefore you are not loosing much more. Regarding your query ... No Refund or set-off ... but you can recover your LBT liability from your customer..
Mr shridhar. The average margins in the business are so low nowadays that it will hardly just cover the octrio payable. How will anyone compete with companies outside maharashtra who save 4.50 % on purchase cost. Navi mumbai has cess of 1% instead. Would shifting there save lbt cost. Greetings, We are into service industry (Non Banking Financial Corp) if we buy something (for office use) in other state and take delivery in Maharashtra, do we have to pay LBT? 1) If Yes, than how can we apply for LBT No. as we do not have CST or VAT no. I AM IN BUSINESS OF MANUFACTURING GOODS OF CONFECTIONERY AND EXPORTING IT THROUGH MERCHANT EXORTER IN AFRICAN COUNTRY . I GET ALL BENEFITS FROM GOVERNMENT LIKE VAT AND EXCISE REFUNDS . CAN I GET BENEFIT OF LBT AS PER RULE 28(6). is it true that every professional like c.a , advocate has to get registered under lbt ? I purchased goods from mumbai & sale it to Non LBT Zone area. Do, I need to Registration for LBT no. ? We are the manufacturer of cement , we regularly transfer our cement to have selling depots by way of stock transfer in Nagpur amravathi. is LBT applicable on stock transfer if enter of goods into nagpur? If so on what value ( consider there would be no selling price for stock transfer). Can we collect the amount from customers at the time of sale? if so what are the thing to be done in invoice ? Thanks For the guidelines, here are some queries. Will you tell us about Payment procedure of LBT? Return and Return Filing Procedure? Just went through your comments and it solved most of my queries. I still have a few though and would appreciate if you could solve them. 1. I am located in Bhayandar and we purchase material from Vasai. Now both of them are different LBT zones. Am I required to pay LBT in Bhayandar or I do not have to pay as my vendor has already paid it in Vasai. 2. One of my products has two parts for instance. If I buy those parts from outside the LBT zone, assemble them in the LBT zone and sell it outside LBT zone, can my product be considered a trading item? 3. If I procure some items from outside the LBT zone (pan India) into the LBT zone and then export it, will I have to pay the LBT? 4. On my purchase of goods, I have to pay LBT. But do I need to pay LBT on the transportation cost incurred in getting these goods in? The local office says we have to pay but in the return forms there is no column to fill in these costs. Just a small addition to my previous comment. Our company is a star export house and I went through Notification No. LBT-0209/CR-65/09/UD-34, and under section 28.6, it states the following. the value of the goods used for the purpose of such export." Does this mean that if I am procuring goods (raw material, semi finished, finished) from outside LBT area into an LBT zone but then exporting the goods outside the territory of India then I am exempt from LBT all together? just wanted to know wether this LBT is applicable on the new flat purchase too. Please clarify. 1) in which stage i will have to pay LBT. 3) any setoff at any place or any form needed like r form at any stage?? We are importing goods from Europe and stocking in Bhiwandi Warehouse and resale to other states. We are registered in Mumbai whether on our Import Purchase LBT is applicable since Bhiwandi is outside octroi limit. WE ARE RETAILER OF FURNITURE. WE SALE FURNITURE TO CUSTOMER ALL OVER MAHARASHTRA. IF WE SALE THE FURNITURE ( BED, WARDROBE ETC.) TO THE CUSTOMER AT THANE. WHO WILL PAY THE LBT. WHO SHOULD GET REGISTERED TO PAY THE LBT. We have a manufacturing unit in Thane. We buy raw material from thane itself, process it and sell at retail shops in thane, mumbai, navi mumbai, pune etc. Pls clarify at what stage we will have to pay the LBT. Is there any waiver for micro small scale industries. Also, when is it that the LBT officials can official collect the taxes. Because there are few people who are targetting small enterpreneurs who take up stalls in exhibitions and collecting random amounts from them in the name of LBT. Is LBT payable only on goods or even labour charges ? @Vidula... LBT is applicable in Thane City from 1/04/2013. The Due Date for LBT Payment for the month of April is 10/05/2013. LBT is to be deposited in banks only. So don’t pay any amount by cash to anyone. @Vijay Walawalkar.. Your based is Mumbai… so till date there is no LBT… If you are selling furniture to your customer in Thane… then the liability of LBT goes to your customer. @Dipti... We will update it very soon. 1) I am a trader based out of Mumbai. If I purchase goods from outside Maharashtra and sell it to a customer who is also outside Maharashtra (goods do not enter MH). Then is LBT payable then? 2) Supoose I purchase goods from a local Mumbai trader who has already paid LBT on his purchase. then do i also need to pay LBT on my purchase from him? If I am paying labour charges, whether I have to pay LBT on such payment of labour charges ? I have purchased a new Honda bike on April 11, 2013 in Ghansoli, Navi Mumbai and its on road cost is Rs. 60K. My bike is with the dealer for RC book processing, etc. While dealer is asking me to pay 4% LBT on top of full payment done earlier. What should i do? what is the percentage of LBT is applicable on a 2 wheeler costing 82000/- ?? i have purchased this vehical from bhiwandi.. and the registration of the vehical is @mumbra location. Hi..whether LBT is applicable on eating house who is purchasing the goods within the LBT zone? If it is not applicable..then whether registration is still compulsory? We are into distribution of goods and our office is based on Ghatkopar. We import goods from Honk Kong and the same goes to our Bhiwandi warehouse which is outside local limits. The same is then distributed throughout India. As this is a tax on Purchase and not on sales , are we affected as we do not by anything locally?? I HAD REGISTERED MY COMPANY AT NALASOPARA ADDRESS. I AM TRADING IN PLYWOOD, TIMBER, VENEERS, CORIAN IN MUMBAI ONLY. I DONT HAVE ANY CLIENT IN REGISTERED AREA. CAN YOU GIVE ME GUIDELINE FOR LBT. if goods are purchase within mumbai limit, LBT will be paid, but if same material is purchased again and again in mumbai, do all the purchaser have to pay LBT or just the first purchaser. please clarify. is this is applicable to kirana stores in kandiwali. and how it works for kirana stores. @Abhijeet Bhamburkar.. If you purchase within city limits then there will be no LBT. @Mrugesh Shah .. If you purchase within city limits then there will be no LBT … but if you purchase from outside city limit then LBT will be applicable. No LBT on re-selling within city limit. Please clarify is there any thing like local panchayat Tax (just like LBT) in Bhiwandi. Some are talking about such taxes too. and further can you please clarify about the unsold stocks after 1st oct 13. Is LBT applicable to them too? I m doctor by profession, how L.B.T. is going to affect me or my profession.. kindly clear my doubts. @Sunny Arora.. If you are purchasing within the LBT zone then there will be NO LBT.. Yes, Registration is mandatory. @Ashwani Vishwakarma... In which Municipal Zone your business is registered ? Due to LBT, will there be increase in the prices for high end mobile phone? We have business outside Maharashtra but sale good across India including Maharashtra. Till now we were paying Octroi, how will position will change now. Hi Shrihdar ,I am in business of flour mill it's called "aata chakki",This is a cash business . Sir, I want to know is it LBT applicable in this business and if yes how would be calculating . I am a retailer, situated in Andheri. I purchase goods from Mumbai and sell it Within Mumbai. Do i need to register for LBT. How many times does one need to pay LBT. Does a company who manufacture Goods and is not registered how can he pay LBT? Join our movement against LBT which is an illegitimate tax being a dual tax only for the state of Maharashtra. Like our Facebook page - "LBT HATAO" and follow us on twitter at #LBThatao. Show your support and make it count. is it reasonable that goods has not entered octroi limits and still lbt is charged?IS IT REFUNDABLE? where can one find rules and regulations of lbt? if a dealer imports goods from outside india and his material is unloaded at nhava sheva port and he sells the material at kalamboli steel market nhava sheva then is he liable to pay lbt. If i am purchasing good from local & selling also in local, do i have to pay LBT on that? where this lbt tax money going to use?is there is an transparency of using lbt tax money. wht r business people get benefit by paying this tax. Is LBT applicable in Dist Raigad..
very impressive, Mr Mhatre . unfortunately , there is no other site from where we could get clarifications , the way you have managed. Kudos. Where do I register and pay LBT - Navi Mumbai or Bhiwandi? Our VAT registeration is in Belapur . Does it make sense to register for VAT also in Bhiwandi ?? I am a trader with office in mumbai, i purchase goods from outside mumbai and sell directly to clients outside mumbai (outside octroi limits). Physical material does not come to mumbai(municipal limits). How will LBT affect me in this case ? @Vibes2388… The current rate of Octroi is 4.5% and LBT is in around 1.5%... so prices will go down. @Pawan Rastogi… If your business is registered outside Maharashtra State then you do not have to Pay LBT. But whenever you supply the goods in Maharashtra State, please mention LBT number of your customers in your Tax invoices. @Farmood Shaikh.. If you purchase the goods within LBT zone and sell outside Maharashtra State then there will be no Local Body Tax. And regarding your second query.. If you are purchasing the material from the outside LBT zone in that only scenario you can recover the LBT cost from your customers. @Hemant Varma.. Basically you are doing job-work.. So you can pay the LBT amount in lump-sum. @Mukul .. LBT is applicable from 01/04/2013 in Thane and the Flat which you are going to purchase is a ready flat then please don’t pay any amount in the name of LBT to builders. @Saurin Gada.. Yes, you have to register your business.. Registration of the Local Body Tax is mandatory..
Why 4% vat became 5%? and lbt is only on purchases..
Are aechitects covered under LBT? We are into real estate business in virar. we use to purchase the building material from both ie Vasai-Virar limit and outside too.Confirm whether in following cases LBT is applicable or not. 1) Purchased material from outside Vasai-Virar limits and vendor does not have LBT No. 2) Purchased material from outside Vasai-Virar limits and Vendor has LBT no. 3) Purchased material from Vasai-Virar and Vendor does not have LBT no. 4) Purchased material from Vasai-Virar and vendor has LBT no. First of all i luvd d site and cld undrstand a lot abt LBT. I m a simple shopkeeper located in Jalgaon municiple corporation, whose buying is below Rs.150000/- p.a. from the jalgaon whole-sellers. i hv ladies corner, dealing in safety pin to dress materials. complete ladies shop. i hv taken LBT registration no. already. 1) buying goods from the jalgaon whole- sellers n sale to jalgaon customers. shall i m liable to pay LBT? 2) my buying is with minimum amount like Rs.1000/- to Rs.5000/- per months, henceforth the whole-seller is not ready to give me a PAKKA BILL ? wat should i do? 3) taking PAKKA BILL is mandatory for me (simple retailer who buy n sell within city limits)? 4) shall i hv to fill NIL Report for LBT or no need to do that? 5)LBT officer forcing me to have to take bill from whole-sellers from whom i hv buy goods.? Your doing a great deal by solving all of dem's query Mr.Shridhar Mhatre. GOOD JOB. Hi Sridhar great work on updates. Hope you can help me out. I am importing international food products (2% LBT applicable based on the sheet you provided). The product will go from my warehouse (inside city limits) to the distributor to the actual retailer of the products. Who exactly will charge LBT in this case and will it be charged twice on the same product( I.e. LBT on sale from me to distributor and then LBT on sale from distributor to retailer). Thanks Shridhar, but what about service given ? 1> YOU ARE A LBT PRACTITIONER ? 2> I HAVE A SHOP AT MUMBAI & GODOWN AT BHIWANDI . OUR MATERIAL WHICH WE PURCHASED FROM MAHARASHTRA IS KEPT AT BHIWANDI . WE SUPPLY MATERIAL ALL OVER MAHARASHTRA FROM BHIWANDI & MATERIAL WHICH WE REQUIRE IN MUMBAI SHOP WE PAY OCTROI & TRANSFER TO MUMBAI . INCASE OF LBT WHAT WE WILL HAVE TO DO ? PAY LBT ON GOODS GOING TO OUR MUMBAI SHOP ONLY RIGHT ? 3> YOU HAVE EXPLAINED THAT WHATEVER MATERIAL PURCHASED IN LBT SHOULD BE SOLD OFF IN 6 MONTHS TO CLAIM LBT REFUND OF 90 % . IF THE GOODS ARE SOLD AFTER 6 MONTHS WHO WILL BEAR THE LOSS . WE HAVE LOT OF ITEMS THAT HAVE TO BE KEPT IN STOCK & ARE SOLD ONLY ON CUSTOMERS ORDER WHICHMAY BE IN A YEAR OR 2 YEARS . 4> WHAT ABOUT THE STOCK LYING WITH ME , SINCE I STARTED THE BUSINESS OF ALMOST 25 YEARS ? THERE ARE MANY ITEMS IN STOCK WITH ME WHICH ARE OUT OF DATE , BUT ARE SOLD ONLY ON ACTUAL REPLACEMENT ORDERS ONLY .WHICH MAY BE ONCE IN 5 YEARS ALSO ? 5> WHAT ABOUT REJECTIONS ? WE HAVE TO GIVE REPLACEMENT TO OUR CUSTOMERS IMMEDIATELY AT OUR SHOP . WHAT ABOUT OF REJECTED MATERIAL WHICH WE SEND BACK TO THE MANUFACTURERS WHICH ARE CURRENT YEARS OR ALSO UPTO 3 YEARS OLD AS IN OUR GOODS WE HAVE TO GIVE WARRANTEE OF 3 YEARS , HOW CAN WE CLAIM THE REFUND ? 6> WHAT ABOUT LBT CERTIFICATES WHICH WE WILL HAVE TO ISSUE TO EACH & EVERY CUSTOMER & ALSO LBT CERTIFICATE WHICH WE WILL HAVE TO RETAIN FOR EACH & EVERY IMPORT OR LOCAL PURCHASE ? WHO IS SUPPOSE TO BEAR THE COST FOR MAINTAINING ALL THAT ? 7> WHAT IF WE SELL MATERIAL OF EXAMPLE 100 PCS WHICH MAY HAVE MULTIPLE PURCHASE INVOICES , HOW IS THAT SUPPOSE TO BE DONE ? 8> WHEN LBT IS NOT PRESENT IN ANY OTHER PLACE IN THE WORLD INCLUDING INDIA EXCEPT MAHARASHTRA . WHY IS IT BEING IMPLEMENTED ONLY IN MAHARASHTRA WHICH GIVES INNUMERABLE RIGHTS TO OFFICERS WHO ARE ONE OF THE MOST CORRUPT IN THE WORLD ? WHY IS THIS BLACK ACT OF INSPECTOR RAJ BEING IMPLEMENTED IN MAHARASHTRA ? 9> WHO IS THE AUTHOR OR CREATOR OF LBT CONCEPT ? HE SHOULD BE GIVEN BHARAT RATNA AWARD FOR COMING OUT WITH MOST BLACK ACT IN HISTORY OF INDIA FROM THE TIME OF BRITISHERS & THE MOGHULS . 10> GOING BY TODAYS STANDARD OF GOING PAPERLESS WHY IS SO MANY RECORDS ARE BEING CREATED TO BE MAINTAINED ? ONE OF MY CUSTOMER IN VASAI VIRAR BELT HAS SAID THAT IN HISTORY OF HIS COMPANY FOR 12 YEARS . HE HAS NOT SUBMITTED SO MANY DOCUMENTS IN LAST 12 YEARS FOR EXCISE & VAT ASSESSMENT , WHICH HE WAS REQUIRED TO SUBMIT FOR ASSESSMENT OF LAST 1 YEAR OF LBT . THERE ARE ALMOST 10 QUESTIONS , KINDLY TAKE YOUR TIME & PLEASE REPLY EACH & EVERY ONE FOR MY INFORMATION & KNOWLEDGE OF ALL . IS IT A FACT IN LBT THAT THE OFFICER IN CHARGE CAN SEAL OUR OFFICE & GODOWN . SEIZE OUR HOME & PPF ACCOUNT & THEY CAN EVEN COLLECT THE OUT STANDING AMOUNT FROM OUR CHILDREN OR LEGAL HEIRS ? IS THE GOVERNMENT TRYING TO ENSLAVE US ? MAKE US BONDED LABOURERS ? NOW ONLY GOD CAN SAVE MOTHER INDIA !!!!!!!! you have not been replying our queries lately . are you there MR SRIDHAR ? 1.If i have kirana store in vasai for which i purchase goods from outside vasai(out of LBT Area).so i will have to pay LBT??? @what purchase value?? 3.In case of MRP goods i cannot add any ammortization above MRP value,so which means i need to absord this LBT cost what i have paid to purchase this goods????? 4. In case of non MRP goods i can add/ammortize LBT cost that i have paid to purchase those goods,but how to calculate ammortization cost to be recovered from customers???? i would be very happy if u can clarify my doubts. Gone through all the comments & was able to understand a bit what exactly is LBT is. But still have some queries. We are in to retailing business having stores all over india. We are having our Head office / logistics dept in Mumbai. We normally purchase goods in Mumbai from various vendors situated all over india. Once we receive the goods, we transfer the goods to our various locations / stores situated all over india. Want to know how the lbt will arise in different situations. 1. We are purchasing in Mumbai from Noida goods worth Rs. 30,000/- & then we are transferring the goods to Mumbai , delhi & Bangalore Rs. 10000/- each(pure stock transfer to our retail stores, not sale). Whether we will be liable to pay lbt on whole 30000/- or only on 10000 which we are retaining in Mumbai or selling from Mumbai. 3. Of the goods sent to Delhi as mentioned in 1st suppose We are transferring goods worth Rs. 8000/- from one of our store in Delhi to our Mumbai store (Pure Stock Transfer) whether we will be liable to pay. I mean the number of times we shuffle the stock & call in Mumbai we will be held liable everytime to keep paying lbt. 4. We are purchasing goods in Mumbai worth Rs. 15000/- from Noida & within 6 months we are returning goods worth Rs. 12000/- as goods were not getting any response in Mumbai. Whether we will be getting credit of LBT for 12000 which we are returning. do we have to take temporary licence? Mumbai it is still not imposed but for Pune what is the rule? what r the books and return details? Does Pune municipality has infrastructure to keep tracks and guide the traders?or they are expert in just penalising the people? I am a Trader in Pune. My Office is Located in Corporation Limit but my Godown is Registered Outside Corporation Limit. I am selling 100% of Goods from godown outside Corporation Limit. Still I have to Pay LBT? or I have to Pay LBT and then have to take Refund as I am selling Goods to Companies outside Corporation Limit? Is it computer institute business is applicable for LBT? whether a Non Practicing Chartered Accountant is also lible to register in LBT & whether a Estate Agent is also Required to Register in LBT if it becomes applicable in Mumbai ?? me ek aam admi hu jo aap se 3 sawal puchata hu. agar iska aap jawab denge to muze bahut khushi ho. 1) L.B.T. jada kiske liye pareshani hai? kyunki hawa aisi chalrahi hai eska effect consumer par padega. vo pls clar karna. 2) L.B.T. jo salary peson hai usko lagne vala hai kya? 3) L.B.T price ke dam badane se consumer bhari nuksan uthana padega. usme kuch rahat hai kya. g.d.p rate will be decrease because of lbt. specify the percentage of lbt on sweets and farsan ?? We manufactured goods in Mumbai city.We purchased raw material from local & from out of Mumbai and we sell goods in local & also out of Mumbai and Maharashtra. 1.A dentist buying material for his patients from outside the limit. Whether LBT applicable. condition , If he his not selling that material to his client but infact he is using it for providing dentist service. I am a trader have our registered shop in Kharghar,Raigad District. 1)I purchase my goods from various states and since it is coming within Raigad district,i guess LBT has to be paid. 2)But when i sell the same goods to various parties(Through Invoices Obviously) in Mumbai,Navi Mumbai,Thane district,Please clarify who has to pay the LBT since it is only after a PO has been raised by my purchaser,the material is then sold to them. In one of the websites,the query posed to law experts is about lbt payable on conveyance of property in a 'flat'. Firstly, the grave doubt is, - if at all payable on any such 'transaction'? IS lbt APPLICABLE near gajanand petrol pump, MANKOLINAKA gundavali BHIWANDI AND anjur phata bhiwandi? but My register office address is at Thane. our Company is situated @ Nashik LBT zone. If we Purchase goods from Out of Nashik city so that case It is mandatory to mention our LBT NO. Supplier on said Inv. I am a manufacturer exporter, what are the rules of LBT on the raw material purchased by us to make finished product which is then exported. i just want to know tha is lbt applicable on purchases of goods from navi mumbai and also the consumption is in navi mumbai.... and is LBT applicable on purchase of plywoods, paints and furniture and fiitings like nails, etc..
we are the traders of Imported Coal in Bhiwandi, we sells coal to small companies in Bhiwandi, so now who need to take the LBT no? Like the Co has to take Lbt No or trader like us? & Who has to pay that amount?? I am running Printing business and registered for VAT. Should I register for LBT? My area is in Pisvali i.e. Kalyan East but that area is not come under the jurisdiction of Municipality. The Company who is selling goods to us Does not charged LBT as we are in Non-Municipal Zone.However we are selling goods in Municipal as well as Non-Municipal Zone. 1. My question is in the above case who will charged the LBT? i.e. a) Selling from Non Municipal to Municipal? b) Selling from Non Municipal to Non-Municipal? c) Any kind of Documentation work required? 2. Do we need to register our-self in LBT Act? Dear Mr. Shridhar..... First of all u are doing a very good job by educating people about LBT. We are registered under Thane Municiple region. Our Nature of Business is Construction. We are doing Tunnel Job for MCGM. My querry is whether LBT is applicable on FOC (Free Of Cost) basis materials also?? & whether it is applicable on replaced materials also?? If so then isn't it we are paying LBT double time on the same material?? 1. Whether LBT is applicable in Thane if Company having (Centralised Store) Warehouse at Mumbai anf transferred Material to its Thane Branch? 2. If Material Purchases from Mumbai to Thane of Rs.112.50 (Cost 100 + Vat 12.50 = Total Cost 112.50), Whether LBT is to be paid on Rs. 100 or on Rs.112.50? : Are we still required to register under LBT, and file 'nil' returns on a monthly/quarterly/annual basis? Thank you for your kind advice in advance, Mr. Shridhar. Iam a Builder & purchase Bricks for our self consumption. We are issued two Bills from the supplier 1 Cost Bill i.e.Vat Bill (Unit Registered outside muncipal Limits) & other is the transport Bill (Marked as payable By consignee i.e. Purchaser). He is not payaing LBT on both the bills. So,please let me know whether he can do so & who is liable to pay the lbt charges. My company is registered in Mumbai. I get jobwork done in Vasai, where the raw material comes in and finished good goes out of Vasai at a vendors workshop. Nothing is consumed in Vasai. Do I need to pay LBT ?? Purchases are billed in mumbai and sale invoice is also outside Vasai. I have query about LBT. Please explain it to me. 1) I am registered dealer under Sales Tax under PMC area. I have purchase goods from mumbai & without entering such goods in PMC area it is transferred to Baramati Site (grampanchayat). Then in such a case should i have to pay LBT & file the LBT return? I am a dealer in Pune. I have registered for LBT and I have the LBT number as it was mandatory was everyone having a vat no. But, I dont import goods from outside Pune, but purchase from distributors from inside Pune and sell them Inside Pune, but the goods might be imported from the whole seller/distributor from outside municipal Limits. I this case, Am I liable to pay LBT?? 1. Is purchaser add LBT amount in their Bill/ Invoice ? 2. Is LBT amount shown separetly in their invoice, or just they add the amount with basic goods value. my average monthly purchase approx 20kg around 10,000 & earning 100 rs. per kg.